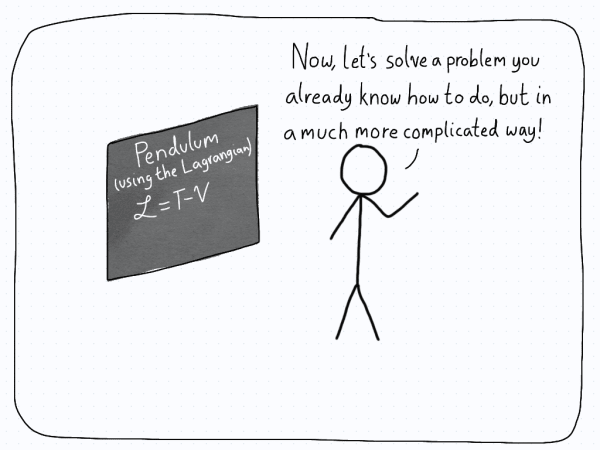 Teaching a new concept within mathematics or science isn’t easy. It requires taking students outside of their comfort zones to try and understand how we model phenomena that is more complex than previously seen. This tends to require new tools and techniques, which means students have to shed their old tools in favour of these new ones. This can leave students disgruntled, particularly those who were attached to the old method of solving problems. While teaching a new concept, one often revisits an older problem that didn’t require these new tools, and shows that the new tools can also solve the problem. This is done quite a bit, because there is a limited amount of time during a class, and older problems can be worked through more quickly. As such, they are good candidates for the first example of a new tool. However, a problem can occur if a teacher only uses these older examples and doesn’t move on to newer, more difficult examples. The reason is that the students will see new machinery being introduced for no good reason. They will ask, “Why do I need this new machinery to solve a problem I can already do without these tools?” If the new tools aren’t vastly more efficient, this can be a valid point from a student, even if the teacher knows there are other reasons to learn this tool. For example, consider classical mechanics. The first classes of classical mechanics involves vectors and calculus. One has to keep track of where the forces point at all times, and deal with each component separately. It works, but as the complexity of a problem increases, using this vector calculus method of solving classical mechanics problems becomes both tedious and somewhat intractable. But Lagrangian mechanics isn’t the endpoint. After learning about the Lagrangian and the Euler-Lagrange equations of motion, the Hamiltonian is used. For myself, this is where things got murkier. The Hamiltonian approach to mechanics was described to me as a more “sophisticated” approach to classical mechanics. I believe that, but in my eyes, the practicality of the Hamiltonian was lost on me. It was an alternative way to use the Lagrangian, but it didn’t feel any better. I wasn’t sold on why this new tool was useful. I think the reason came down to not having any examples where I could say, “This is where I need to use the Hamiltonian1.” The Lagrangian method was adequate for me, so I stuck with it and paid the Hamiltonian method little attention. This is an issue that can arise when teaching a lot of mathematics. We develop a tool with the students, they get better with that tool, and then we tell them, “Hey, there’s actually another tool you need to learn, and it will be useful.” Then we fail to deliver on this promise when we rely on simple examples and past problems to showcase the new tool. That’s not enough! If we want students to be on board with the new tools we teach them, then we have to push the students’ boundaries a bit. Put them into a situation where the old method fails, which will force them to try the new tool. Show them that this is what the tool really excels at, and that there isn’t a better way to solve the problem. Note here that I’m not suggesting that we tell students this is the way or the only way to solve a problem. Rather, we should be able to come up with examples where the “reasonable” strategy to solve a problem is with this new tool. If you don’t do this, you will get students who stick with the old method of solving a problem because it’s the method they are used to, and they won’t get to see how good another method can be. Your job is to at least give students a glimpse of that alternative way. There’s one last important thing that I want to say: I despise test questions that “force” a method of solving on the student. There is only one good side to this, and it has to do with the fact that forcing students to use a certain method will give them a hint as to how they can solve the problem. Apart from that, I don’t think it’s productive to force or insist that students use a particular method to solve problems. Of course, there’s nothing wrong with having students solve problems in a particular way during an assignment (after all, that’s for practice). Tests, on the other hand, should be left wide-open in terms of solving strategies. A test should seek to answer the question, “Can a student use appropriate steps to get to the answers?” I realize that there’s the issue of covering the whole curriculum, but then I would suggest writing problems that steer students into a particular way of solving, but without forcing them to. This way, if the tool was introduced in a way that made it clear why it existed and what kind of problems it simplified, the students will be able to make that connection and solve the problem during tests.